Gleneagles Penang Hospital is a renowned tertiary care providing multispecialty hospital in Malaysia, established in 1973. The hospital offers a range of comprehensive healthcare services and has a capacity of 360 beds is fully-updated with advance technology and modern infrastructure. Gleneagles Penang Hospital is a world class facility with facilities and services in a number of specialties, having a team of highly-qualified medical professionals and skilled support staff. 10 modular operating theatres with two digital operating rooms for minimally invasive surgery. Radiology Department having 640-Slice C.T. Scan, Bone Mineral Densitometry, Digital Fluoroscopy, Digital general X-ray, 3T MRI, Tomosynthesis Mammography, Neurological Interventional Procedures, Ultrasonography. Fully-equipped Cath Lab for complex cardiac procedures, and a Minimally Invasive Surgery (MIS) Centre, along with Haemodialysis, Radiotherapy and Rehabilitation Centres. Laboratory services with a blood bank and a Neurophysiology Laboratory offering EEG, Nerve Conduction Studies (NCS), Electromyography (EMG), Visual Evoke Potential (VEP), Brainstem Auditory Evoke Potential (BAEP). Round the clock available Emergency care Department with ambulance service. 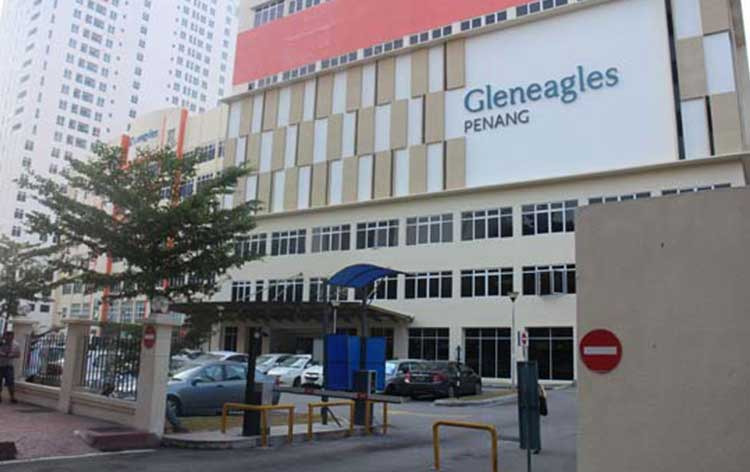 Gleneagles Penang Hospital is one of the top hospitals in Malaysia offering multi-disciplinary specialty services with outpatient, inpatient and emergency care facilities to domestic as well as international patients. The hospital has ultra-modern technology set-up with advance technology, handled by expert medical professionals to provide best treatment and high quality clinical care. International Patients Centre at the hospital caters to the needs and requirement of patients travelling from overseas to obtain world-class medical services and assist the patient and attendant throughout their stay. Nearest Airport: Penang International Airport is 19 km away from the hospital and takes approximately 25 min to reach via road. Gleneagles Penang Hospital performs 201 different procedures. Click on a procedure name to see more details and to view doctors for that specialty. 4.7 average based on 51 reviews.